Launch of the innovative FluoroCycler® XT – a high-performance PCR instrument for all known PCR technologies. The FluoroCycler® XT is the only instrument to support the unique LiquidArray technology. Launch of FluoroType® MTBDR VER2.0: The improved FluoroType® MTBDR assay is based on the innovative LiquidArray technology and enables reliable MDR-TB diagnostics within 2.5 hours only. Second international Hain-Symposium on infectious diseases, Tübingen, 26. – 27. September 2018: more than 70 experts from 13 countries joined the symposium to discuss current topics in infectious diseases as well as trends and opportunities in molecular diagnostics. Extension of NTM product series with GenoType CMdirect for the detection and differentiation of M. tuberculosis complex and more than 20 clinically relevant NTM directly from patient specimens. We are extending our range of test systems for detection of human pathogenic viruses. Hain Lifescience introduces their first quantitative real-time PCR assay FluoroType® EBV: Molecular genetic test system for quantification of Epstein-Barr virus. Introduction of FluoroType® VZV: Molecular genetic test system for detection of varicella zoster virus. Launch of FluoroType® BKV and FluoroType® Parvovirus B19: Molecular genetic test systems for quantification of polyomavirus BK or parvovirus B19, respectively. Extension of mycobacteria product series with FluoroType® MTBDR for the detection of M. tuberculosis complex and its resistance to rifampicin and isoniazid. International Hain-Symposium on infectious diseases, 29 – 30 June, 2016, Tübingen. WHO recommends our GenoType MTBDRsl VER 2.0 as first and only test for the detection of additional resistances in MDR-TB patients and XDR tuberculosis. Extension of the NTM product series with GenoType NTM-DR: Test system for the identification of non-tuberculous mycobacteria (NTM) and their resistances to macrolides and aminoglycosides. Relaunch of FluoroType® MRSA VER 2.0: Now available with internal control! Relaunch of GenoType MTBDRsl VER 2.0: Detection of resistances to fluoroquinolones (gyrB gene) and canamycin (eis gene) in M. tuberculosis complex possible! Extension of the instruments product range: Launch of the optical thermal cycler FluoroCycler® 96 for up to 96 samples in combination with our FluoroType® assays. WHO recommends our line probe assay, GenoType MTBDRsl VER 1.0, for the detection of resistances to second-line antituberculotics. • FluoroType® NG: Test system for the reliable detection of Neisseria gonorrhoeae from patient specimens. • FluoroType® CT: Test system for the reliable detection of Chlamydia trachomatis from patient specimens. International Hain-Symposium on tuberculosis diagnostics, 26 - 27 June 2012, Stuttgart. Launch of the FluoroType® technology as a basis for the FluoroType® test systems. The FluoroType® system includes the fluorescence-based test systems, the optical thermal cycler FluoroCycler®12 and the Fluoro-Software® for reliable evaluation and result interpretation. • The most important human genetic parameters can now also be detected using FluoroType® assays: FluoroType® HLA-B27, FluoroType® Factor V, FluoroType® Factor II, FluoroType® MTHFR C677T, FluoroType® HH C282Y and H63D, FluoroType® LCT und FluoroType® IL28B. • FluoroType® MTB: Rapid and highly sensitive detection of M. tuberculosis complex from patient specimens. • FluoroType® MRSA: Rapid and highly sensitive MRSA detection from patient specimens. • FluoroType® HSV, the first virological assay: Rapid test for the identification and differentiation of Herpes simplex virus HSV-1 and HSV-2. Relaunch of GenoType MTBDRplus 2.0: Now even better! MDR-TB detection not only from smear-positive and culture samples but also from smear-negative pulmonary patient specimens. Set-up of the subsidiary Hain Lifescience UK Ltd in Byfleet, United Kingdom. Extension of the mycobacteria product series: GenoType LepraeDR for the detection of M. leprae and its resistances to rifampicin, ofloxacin and dapsone. • GenoXtract®: Fully automated instrument for the isolation of nucleic acids from various sample materials. • GenoScan®: Automated evaluation and result interpretation of GenoType- and GenoQuick® assays. Launch of GenoType MTBDRsl: identification of the M. tuberculosis complex and its resistances to fluoroquinolones, aminoglycosides/cyclic peptides and ethambutol from cultivated material or pulmonary smear-positive patient specimens. Beginning of the distribution of molecular genetic assays for the detection of over 345 bacterial species and yeasts in whole blood from Molzym. Beginning of the distribution of test systems for the detection of Carbapenem resistances and KPC-ESBL from Check-Points. Set-up of the subsidiary Hain Lifescience SA (Pty) Ltd in Midrand, South Africa. 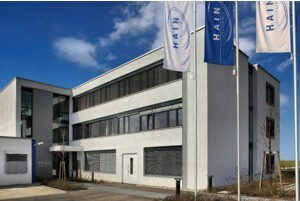 Set-up of the subsidiary Hain Lifescience S.L. in Vigo, Spain. Set-up of the subsidiary Hain Lifescience East and Central Africa Ltd. in Nairobi, Kenya. WHO recommends our line-probe assay, GenoType MTBDRplus VER 1.0, as a screening test for MDR tuberculosis. Launch of GenoType MTBDRplus: Identification of the M. tuberculosis complex and its resistances to rifampicin and isoniazid from cultivated material or pulmonary smear-positive patient specimens. Introduction of the isolation method GenoLyse® for the easy and fast manual extraction of bacterial DNA from patient specimens. Inauguration of a new company building of over 1.300 square meters in Nehren with laboratory, production and office facilities. Launch of the GenoQuick® technology, which is the basis of all GenoQuick® test systems. Introduction of GenoQuick® MRSA as the first test system based on this technology. The GenoQuick® MRSA allows the rapid and specific MRSA detection from patient specimens. Launch of the GENO•CARD: Easy DNA isolation method for use in the human genetic GenoType product series. Continuous expansion of the GenoType product series and expansion of the international distribution network. • GenoType MTBDR: Detection of the M. tuberculosis complex and its most relevant resistances to rifampicin and isoniazid. • GenoType Mycobacteria Direct: RNA-based detection of the M. tuberculosis complex and four common mycobacteria other than tuberculosis (MOTT) from patient specimen. • Replacement of GenoType Mycobacterium by the introduction of GenoType Mycobacterium CM and GenoType Mycobacterium AS. Change of the company name to Hain Lifescience GmbH. Set-up of an international distribution network with partners in Europe. Launch of the first mycobacteria test: GenoType Mycobacterium for the differentiation of the M. tuberculosis complex and common MOTT from cultivated material. Launch of the first MRSA test: GenoType MRSA for the detection of S. aureus und S. epidermidis and the mecA gene from cultivated material. Completion of a second company building with laboratory, manufacturing and office facilities in Nehren. Beginning of the distribution of ELISA tests for the diagnosis of pancreatic insufficiency from Bioserv Diagnostics. Launch of the first human genetic test system: ThromboType® for the detection of the Factor V Leiden and prothrombin G20210A mutations. Beginning of the distribution of ELISA tests for Chlamydia diagnostics from Savyon Diagnostics. Development of the DNA•STRIP technology which is the basis of the GenoType product series. Launch of the first test system based on the DNA•STRIP technology: micro-IDent® for the detection of periodonto-pathogenic bacteria in tooth pockets. Development of a German-wide distribution network. First company building in Nehren. Set-up of Hain Diagnostika GmbH. Foundation of a mail order company by the brothers David Hain and Tobias Hain.